A: After graduating from high school, I was accepted to attend the U.S. Naval Academy to pursue a career in the Navy. One month prior to my departure I read a newspaper article describing a new medical school at the University of Missouri-Kansas City which accepted students directly out of high school and trained them for six straight years. I interviewed with the school and to my surprise was accepted. I resigned from my Naval Academy appointment and the rest is history. I finished my residency in Emergency Medicine at Johns Hopkins Hospital in 1981 and began work in the Emergency Department at Overlook Hospital in 1981. 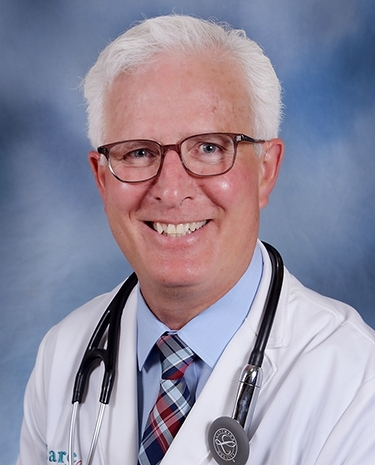 In 1994, I joined Care Station Medical Group as its Medical Director and a general practitioner. A: When I was 10 years old, I took my friend’s brand new bicycle apart just to learn how the 3-speed transmission worked. His father was not happy. I put it back together perfectly and it all worked out. I was driven to learn how things worked on the inside. As a kid I also dissected a shotgun shell which blew up in my face (not so smart). I decided to study medicine to figure out how the human body works. A: I practiced Emergency Medicine and Urgent Care for the first 13 years of my career. I loved making interventions which change people’s lives and in some cases saving their lives. For the last 23 years, I’ve enjoyed my Primary Care practice which allows me to get to know more details of my patients’ lives. A: Professionally, I’ve developed what I believe is a nice combination of diagnostic skills and interventional skills. I ride a motorcycle. A: I see patients during office hours for 20 hours/week and spend the other 20 hours/week supervising and coordinating the care provided by our other Care Station Physicians and Physician Assistants. A: I’m proud to have learned as a kid the discipline necessary to become an Eagle Scout. On a personal level, I’m very proud of my kids, step-kids and grandkids. I’m proud to have friends with a sense of humor. I’m most proud to be blessed with a loving and wonderful wife. On a professional level, I’m proud to have been part of the Care Station Medical Group team as its Medical Director for the last 23 years. A: Primary care is changing dramatically with respect to its integration into larger medical groups. These are exciting developments which are making a huge change. A: Care Station is on the front line of changes in healthcare. We see patients when they are both most vulnerable and most demanding. It’s not easy but very rewarding. A: Let me count the ways: 1. Great staff and great quality care. 2. Open, easy access 3. Part of a larger coordinated health system with local health systems. A: I enjoy a great martini and cigar. An old friend told me to choose your vices carefully. I’ve done ok with these two. A: Motorcycles, golfing, reading and tending to my small orchard.